So for today, I have for you… a cardigan! A lovely black lightweight merino knit cardigan, to be precise. Black isn’t really my thing, but it’s also a very useful colour to have as a cardigan, as it actually goes with other things. (Unlike many of my garments, which pile together in a colourful, clashing mash-up of crazy prints.) So I pulled this lovely super-fine merino out of my stash, paired it with a black-with-green-floral print cotton I got from Fabric-a-brac a while back, and set to work. Photos were taken around on the Miramar Peninsula, while hanging out with the lovely Nikki and Sandra. (Thanks, ladies!) We went to see a great movie together (whose name I just completely forgot, but it was about “the worst singer in the world” and was utterly delightful), then nabbed some photos on the coast on the way back home. What are you making at the moment? Go on, give me some inspiration on what to start next! And here’s why I haven’t been around much lately…. Well, actually, there are a few reasons! (Including a new job – exciting! 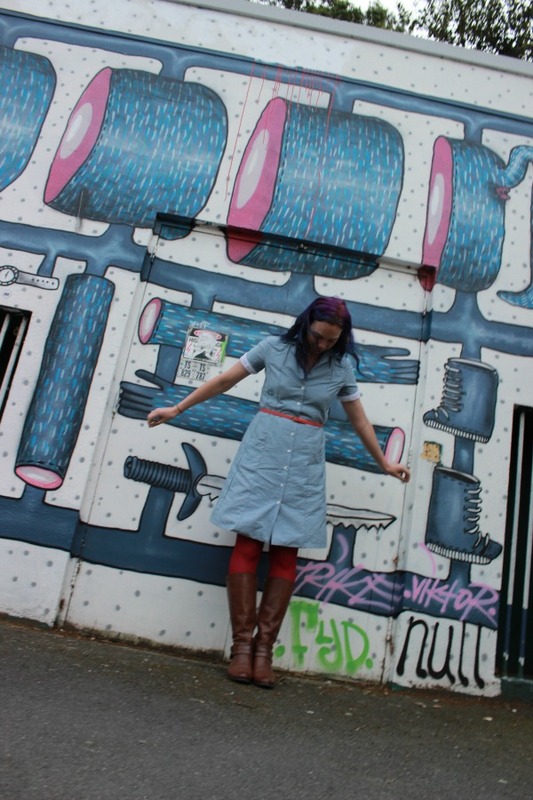 And all the madness of getting ready for Indie Pattern Month over on The Monthly Stitch.) But the main one – I’ve been hard at work on my next pattern. Eek! 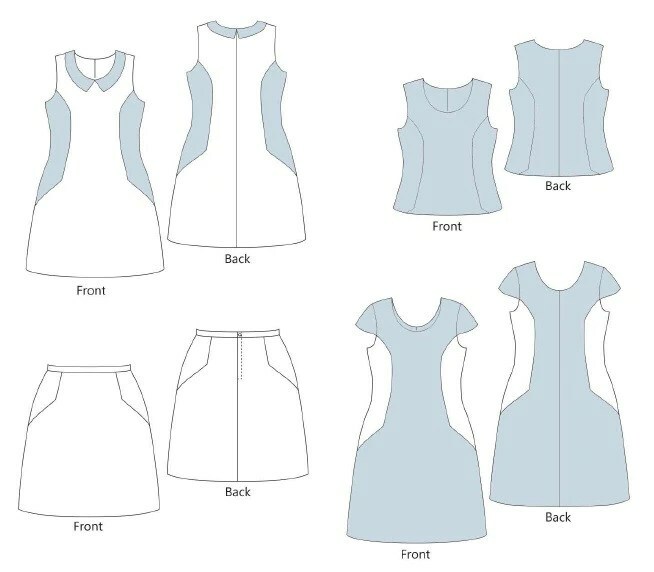 The Philippa pattern references late 60’s mod styling in it’s princess seams, slim fitted style, panels, jewel neckline, and wide, flat collar. Plus, there’s a mini length option for the skirt – after all, you can’t reference late 60’s mod style without a nod to the mini skirt! As with all my patterns, I added in several variations to make it versatile and easily remade several times for completely different garments. 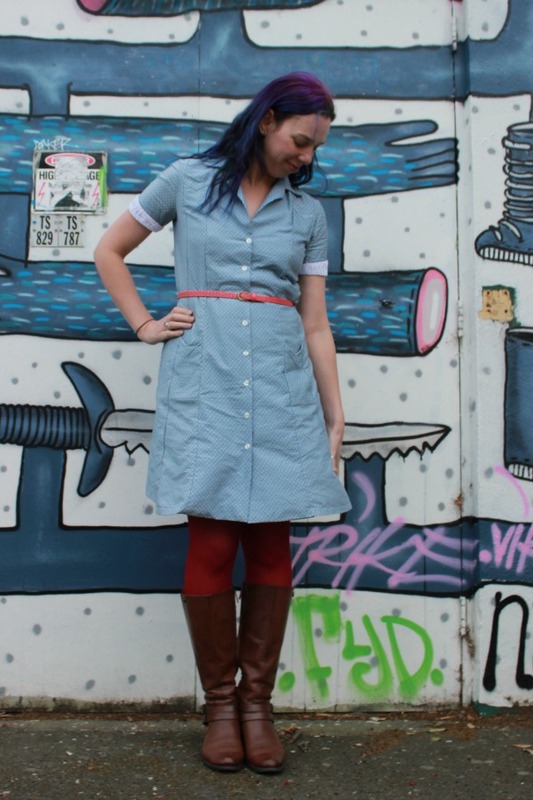 Philippa can be made as a dress, a top or a skirt. 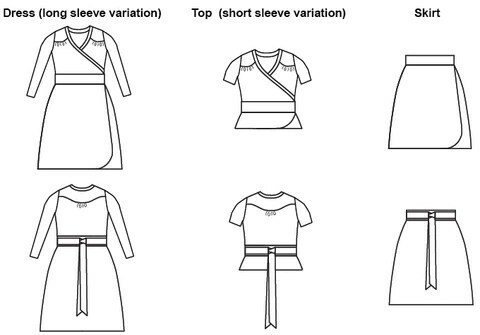 With cap sleeves, sleeveless, or slightly cut-away shoulders. With a scoop neck, jewel neck, or collar. With or without pockets. And with a knee length or mini length skirt. Lots of ways to mix-and-match! 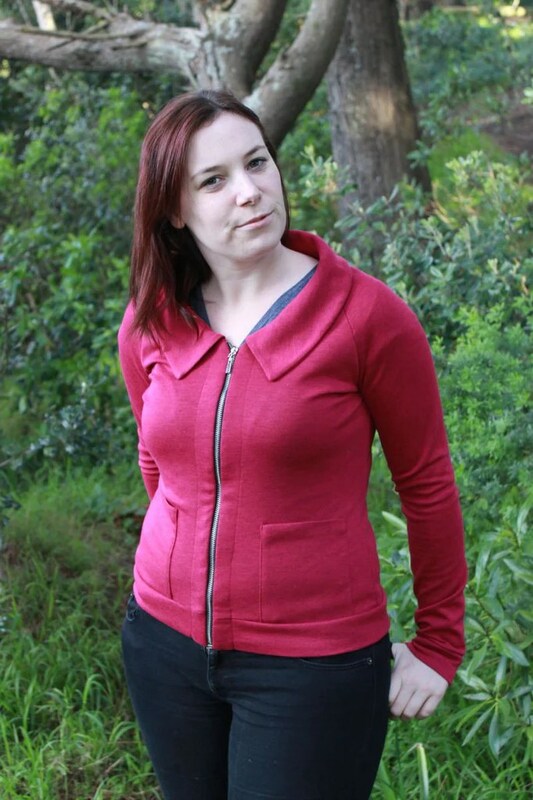 Oh, and there’s 15% off the Philippa pattern until end of day Monday 2 May, with the code ‘HELLOPHILIPPA’. 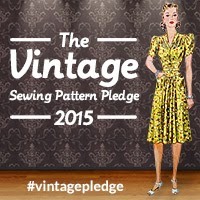 Plus, the full sale price (less bank fees) of all Philippa patterns sold between when it launched and end of day Monday 2 May will be donated to the Cancer Society, a charity chosen by the wonderful person who inspired the pattern. 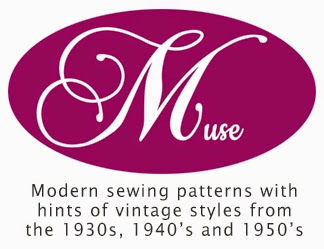 So here’s what I’ve been working on lately – the newest pattern for Muse. This one’s called Sophie. Because I love cardigans, it’s another cardigan pattern. 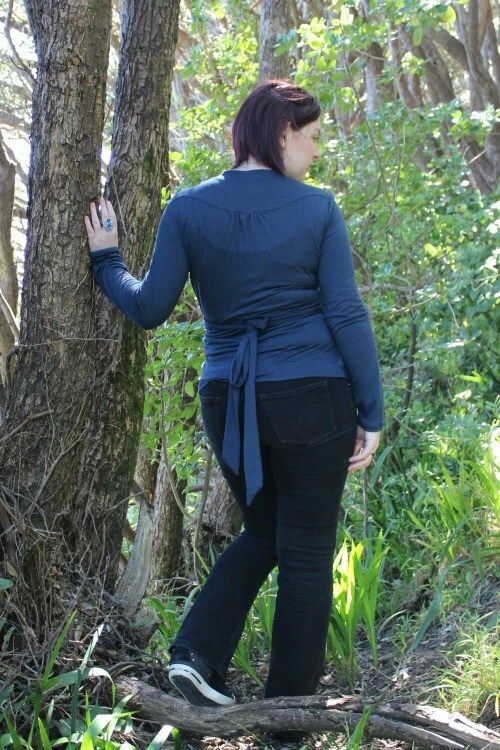 A more casual style than the Jenna – it’s semi fitted, sitting at the high hip, and has raglan sleeves (which gives fun options for colour blocking). There are other variations to mix and match with as well. Two pocket options (classic patch pockets, or inset pockets with a curved pocked opening), and a choice of button up or zip up front. Lots of ways to mix and match! 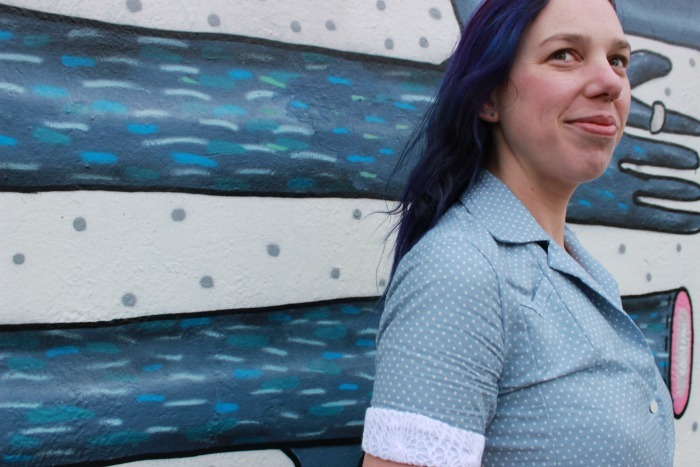 And like the other Muse pattern releases, the first weeks sales (less bank fees) are all getting donated to charity – this time, the St John ambulance and emergency services. Plus you can get 15% off between now and 27 July – just use the code ‘HELLOSOPHIE’ at checkout. It’s a funny thing, but I always feel a little odd, posting about something I’ve made using one of my own patterns. It’s quite a New Zealand type thing, really – we’ve got this phenomenon over here called Tall Poppy Syndrome, and the flip side of it is that we all tend to be almost painfully reluctant to talk about things we’ve done that we’re proud of. Crazy but true. And you see it evidenced everywhere. People downplaying achievements, brushing off compliments, pointing out things they didn’t do so well to take the focus off things they did do well. You even see it in companies hiding awards in cupboards, embarrassed to be seen putting them out on display. We’re a shy, self-deprecating bunch over in this corner of the world. And I’m very much from New Zealand. Which means, I’m not particularly good about talking about things that I’ve done, either. Turns out the main way it shows up here is when I make something with one of my own patterns – I feel a strong reluctance to talk about it, a fear that it would be seen as self-congratulatory, boasting, or similar. Yep, I feel kinda embarrassed to show that I like my own pattern enough to use it to make myself things. Silly, isn’t it?!? So today, here’s a new Melissa dress that I’ve made. 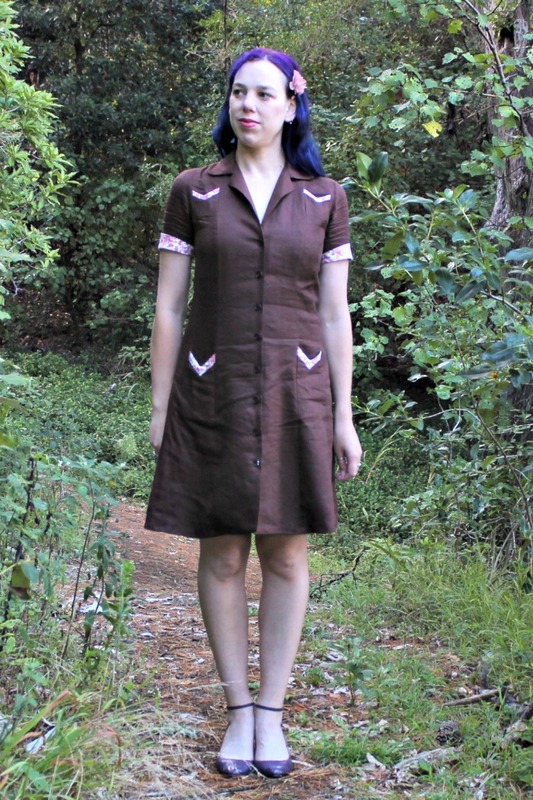 Anyway, ever since I made my brown linen Melissa dress, I’ve been wanting to make myself another one. I wear that one all the time (as evidenced during Me Made May, a round-up post of which I’ll get up on here sometime soon!). The idea of a polka dotted one in particular was stuck in my mind. 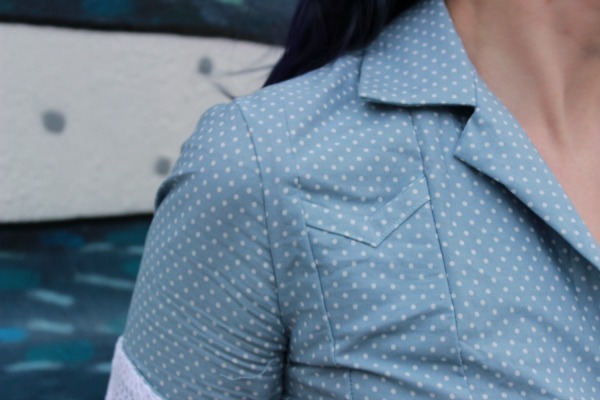 And then, when I was happily procrastinating by browsing the Minerva fabric selection, I came across this beauty – a polka dotted chambray! Woo hoo!! Perfect. I had one heck of a time deciding which colour way to use though. Indigo? Sky blue? Argh! Both so pretty! In the end I went with the sky blue, even though it’s a lighter colour than what I’m usually drawn to. 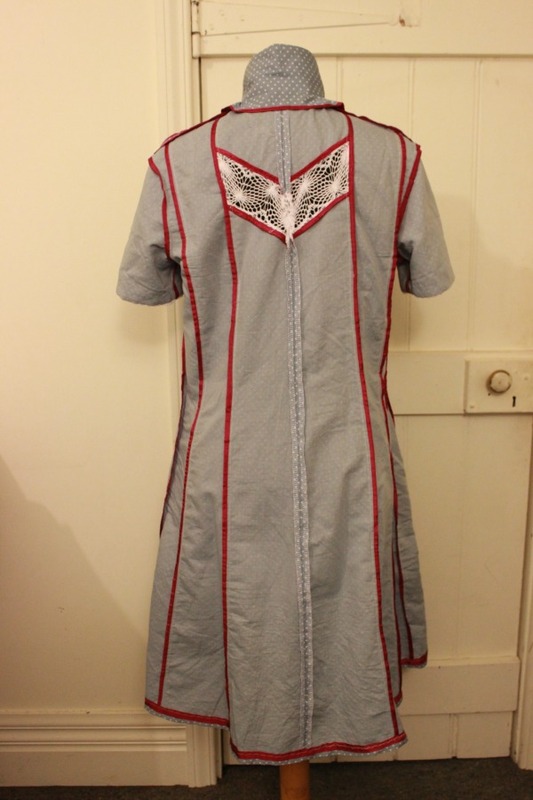 A key reason I chose this one was because of the fabric I wanted to use as the contrast inset at the back. 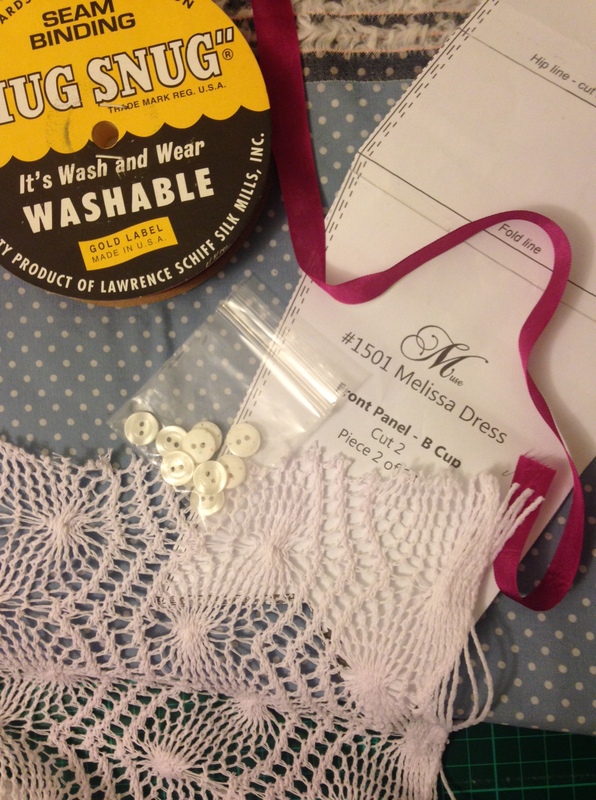 You see, I’d spotted this pretty cotton crochet-look lace, and got to wondering how it would look for the contrast. 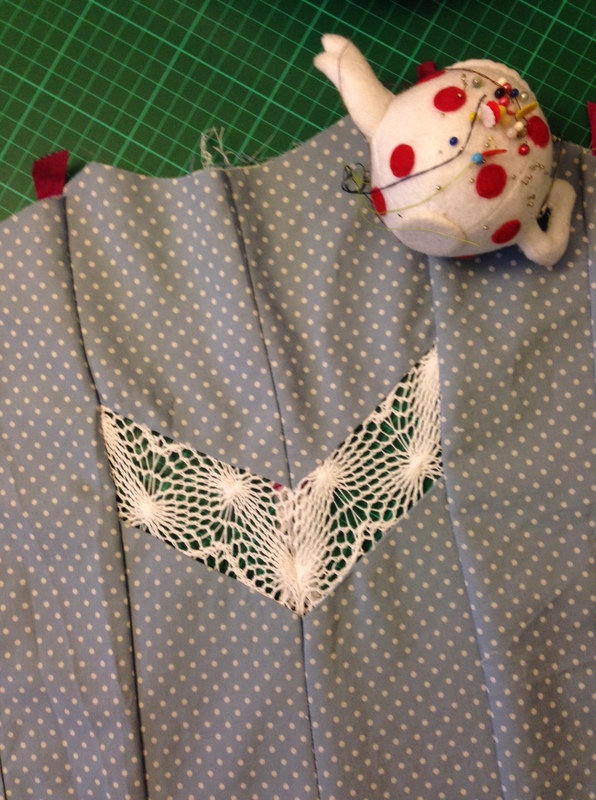 A lace v inset? 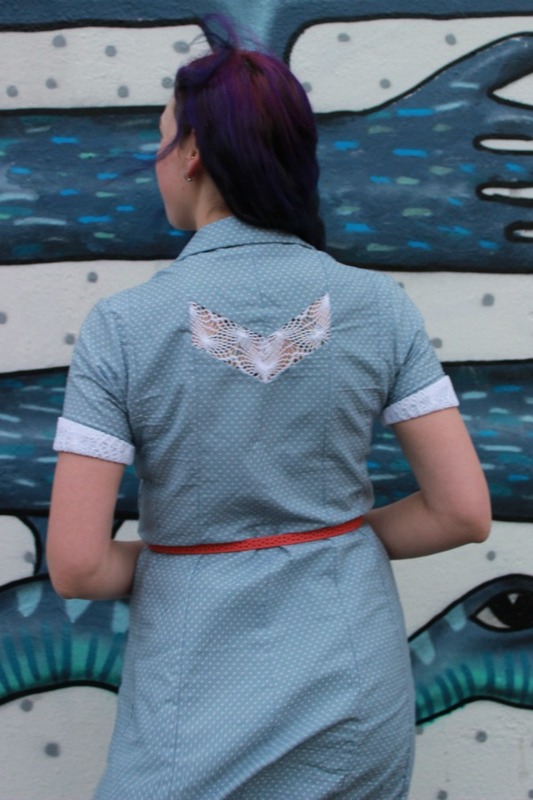 Hmmm…..
I’m really happy with how the lace looks on the back inset – I think it adds a fun and pretty touch. The sleeve cuffs required a bit of thought though. The cuffs are made by making two identical bands, sewing them right sides together, then flipping them out wards. The seams are enclosed, and the cuff is then attached to the sleeve. All well and good, but doing that with lace would have meant visible seams on the inside. After giving it some thought, I cut the cuffs out in lace, chambray, and a lightweight fusible interfacing. I laid the lace with the wrong side of the lace against the non-fusible side of the interfacing, and treated them as one piece. Then, once the two cuff sections (one in lace and interfacing, the other in chambray) had been stitched together and turned right sides out, I fused the interfacing to the chambray, thus capturing the seam between those two layers and keeping it hidden. The interfacing also gives a solid white background for the white lace, which I think looks quite effective. 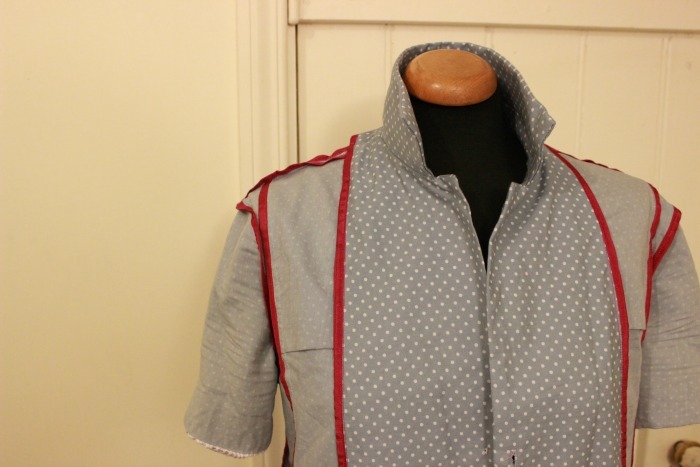 The chambray was a dream to work with – wonderfully light, with a great drape and a fine weave. It presses well and hangs well, and is soft and lovely to handle. I may be in love with it. 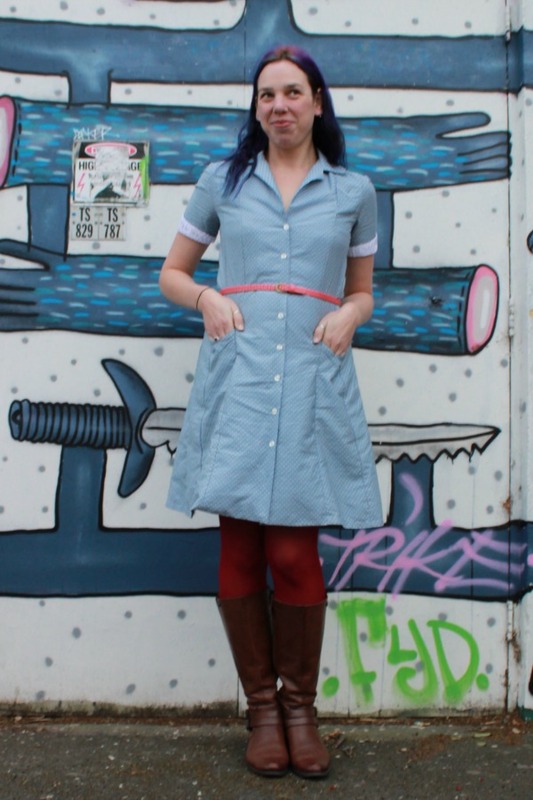 And now I want it in the indigo colourway as well, to make something else! It’s the perfect weight for dresses, I reckon. Just for the fun of it, I used fushia coloured Hug Snug on all the seams. The one exception being the centre back seam, which I overlocked and pressed open, as I didn’t want the Hug Snug to be visible through the lace inset. 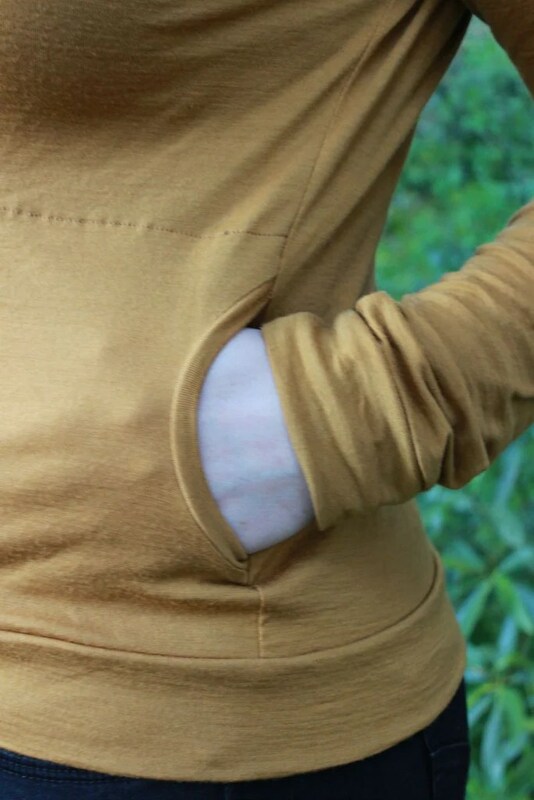 Because there are a heck of a lot of seams, rather than pressing them open I pressed all the others to the side and bound both sides together with the Hug Snug. I love the inside – it’s so bright and cheerful! The photos were taken outside a sub station near where I work, by my lovely colleague Kelly. (Thanks, Kelly! You rock!!) It’s always a bit tricky getting photos this time of year – dark before work, dark when I leave work…. It was pretty windy, you may spot a bit of hair sticking straight up in one or two of the photos! I’d been wearing the dress all day at work too, so it’s got those good ol’ lived-in creases going through it. 😉 The graffiti is by a local artist – he’s quite prolific, with his work featured all over the place. Lots of happy smiley cartoon animals who are oddly dissected but seem perfectly fine about it. Strange. But also colourful, so I’m down with that. 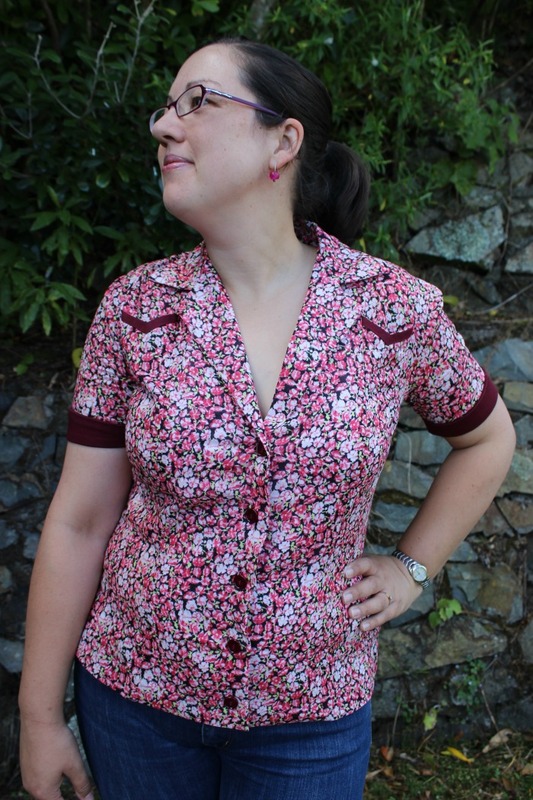 Also, the fabric and buttons were given to me for my monthly contribution to the Minerva Sewing Bloggers Network. 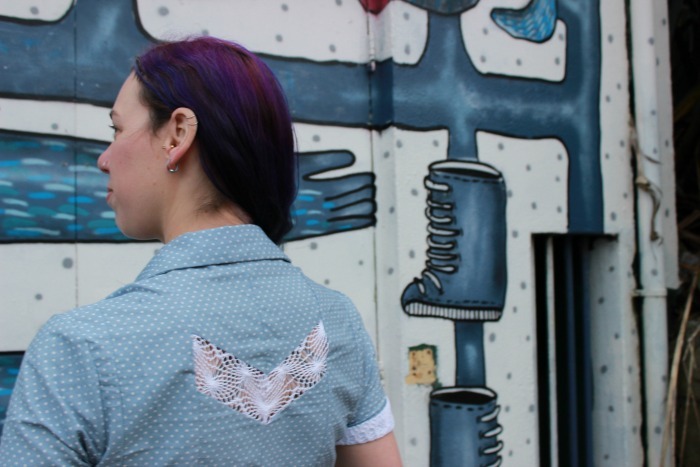 You can see it all over here, along with pretty things made by other lovely sewing people. Yay! Sewing! Want to see what I’ve been working on for the past three months? 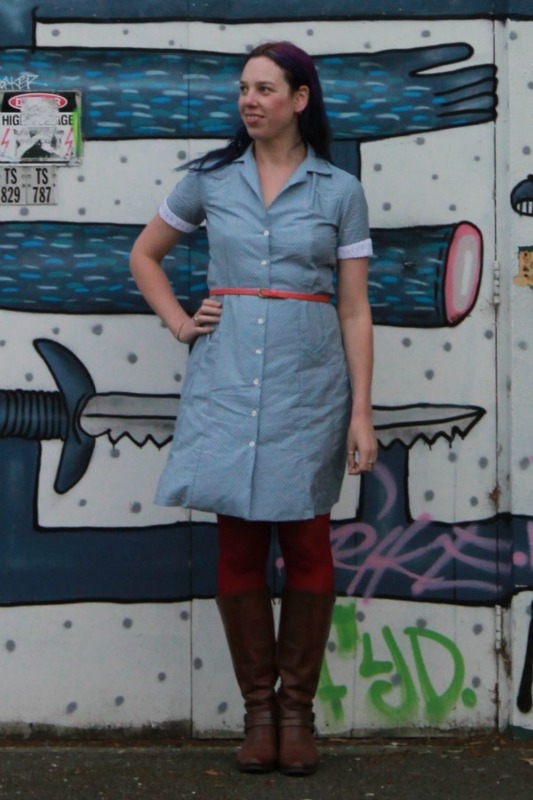 The latest Muse pattern – the Melissa dress, blouse and skirt. I’m pretty excited by it, and really happy with how it’s turned out. It’s got a lot of 1940’s touches running through it, while at the same time I think it’s still quite a modern design. The starting point for this design was a combination of two things – my current wardrobe needs (i.e. front access ha ha yeah) and the knowledge that I wanted to design a pattern inspired by my lovely friend Mel. 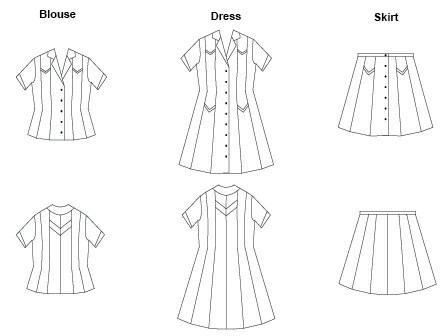 Since when I think of Mel’s style, I think a-line dresses and skirts, collars, blouses/shirts, and skirts, it seemed pretty natural to design a shirt dress pattern with blouse and skirt variations, sleek lines, and an a-line shape. 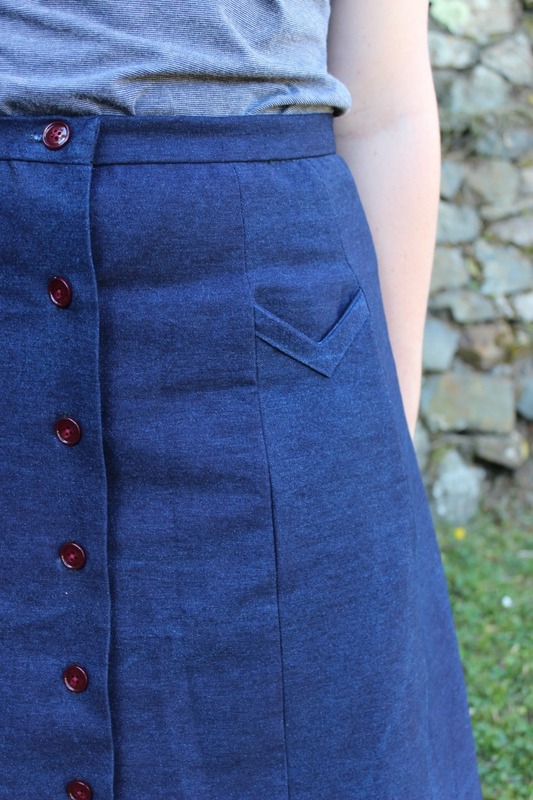 The 1940’s inspiration came in through the use of the v-shaped pockets on the bodice and skirt. 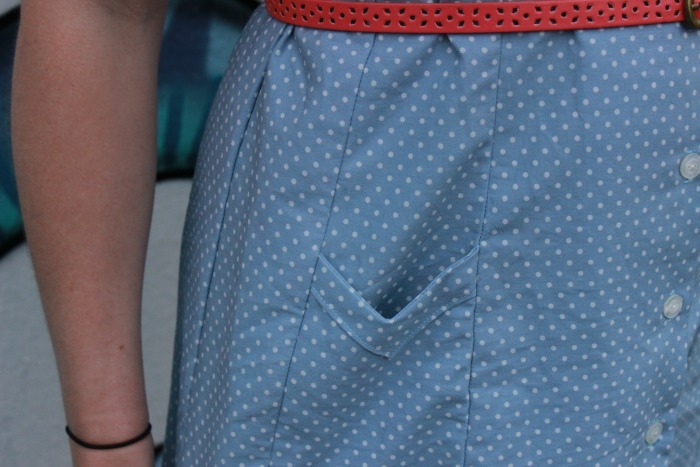 Pockets were often used as a design feature in 1940’s garments, and the v-shape also crept in there a lot (possibly V-for-victory?). The double princess seams originating from the shoulder are also a 1940’s design element and let those pockets be constructed in a way that allows for the v-shaped pocket edgings and nice, clean finishes. When I was shopping for the fabric for the samples for the website photos, I found this gorgeous chocolate brown linen. It seemed like a good idea for this one – a solid colour so the design lines could be seen, but not the notoriously-hard-to-photograph red, black or navy. It got released the other day, and if you’re interested, there’s 15% off until 27 March with the code ‘MELISSA’. There’s the standard first-week-goes-to-charity thing as well, with 100% of the sale price (less those pesky bank fees) of all sales up until the end of 27 March being donated to the Life Flight air rescue and air ambulance, a charity chosen by the lovely Muse behind this pattern’s design. And now, I’m gonna go sew something for myself….! 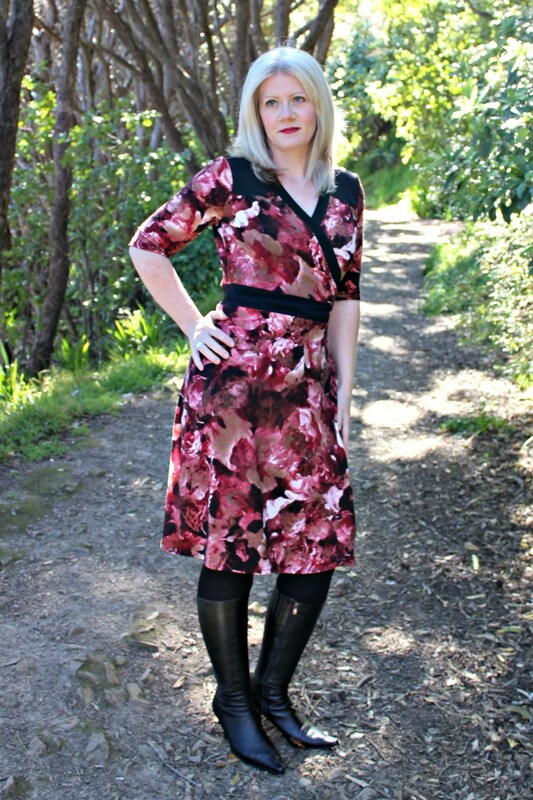 Introducing the Gillian wrap dress pattern! 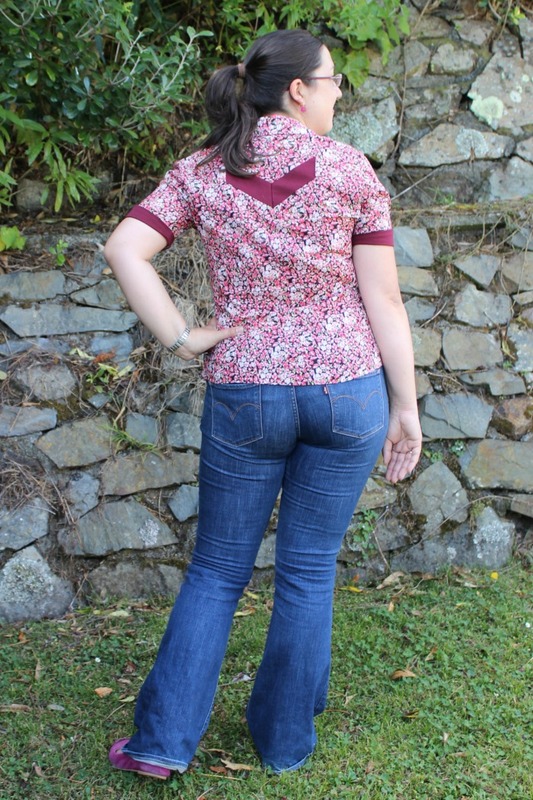 Check it out – my second pattern release! Wheeee!!!! 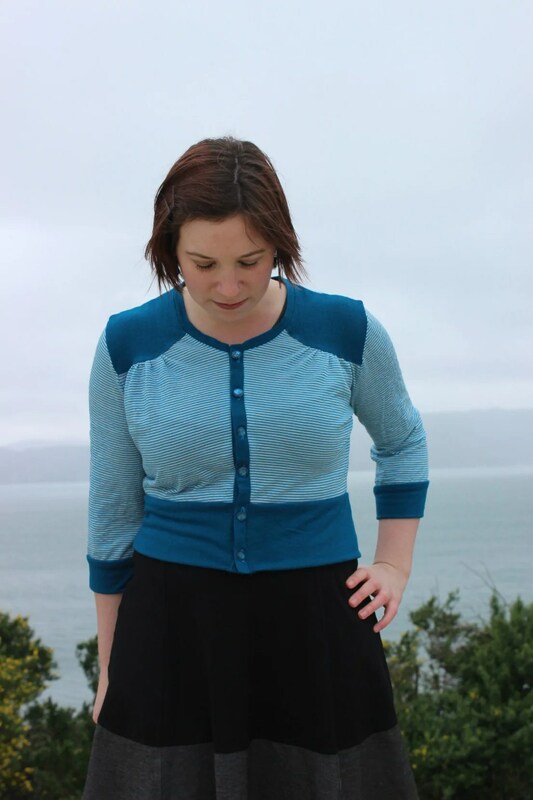 This one is for a knit wrap-around dress (or top, or skirt). 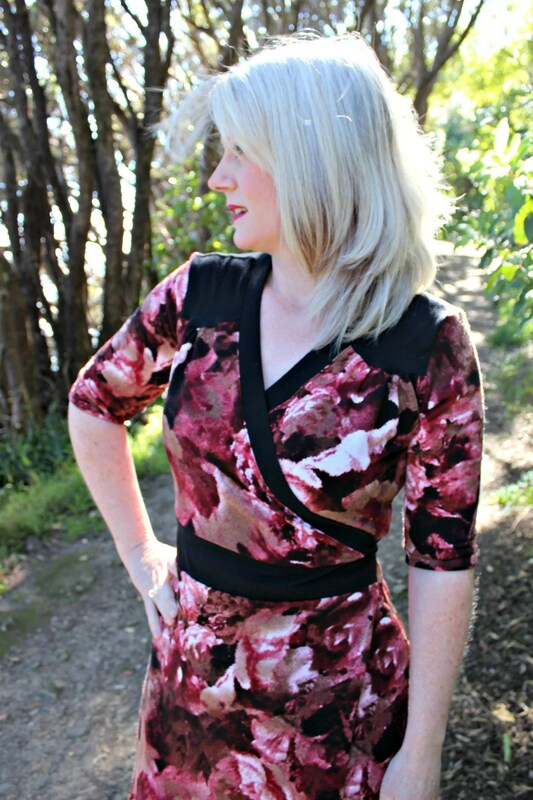 Named after my lovely friend Gillian, who is a huge fan of wrap dresses and tops, and wears them extremely well. (That’s her in the pink dress – isn’t she gorgeous?!?) Gill’s lovely – she’s got a sly (and rather naughty!) sense of humour, a fabulous Scottish accent, awesome style, and she’s one of the most kind, caring and generous people I know. So when I was thinking up ideas for my second pattern, it seemed only right to design one with her as the ‘muse’. And since Gill is such a super generous person, it also seems like a good time to kick off something I’ve been wanting to do for a while – namely, a bit of a charity project. Gill is a big support of the NZ Breast Cancer Foundation, and with good reason – it’s a pretty awesome charity, doing lots of amazing work. 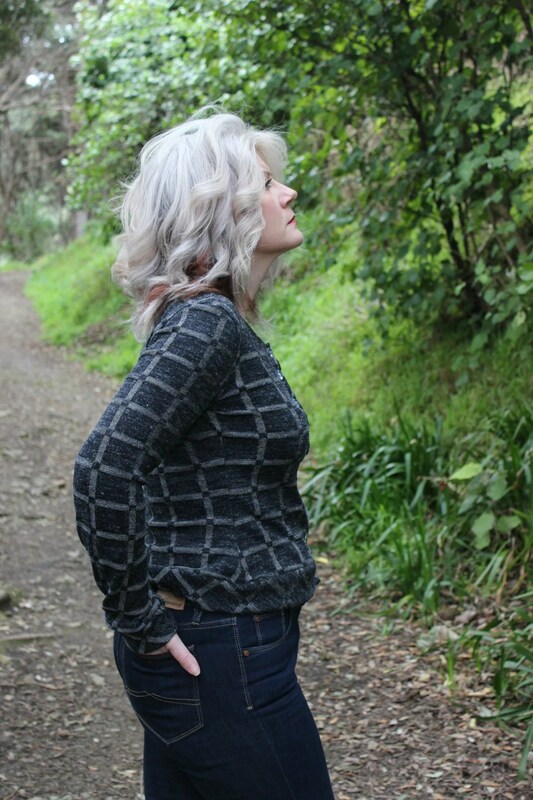 So for the first week the Gillian pattern is up for sale, 100% of the sale price (less transaction fees) will be donated to the NZ Breast Cancer Foundation. 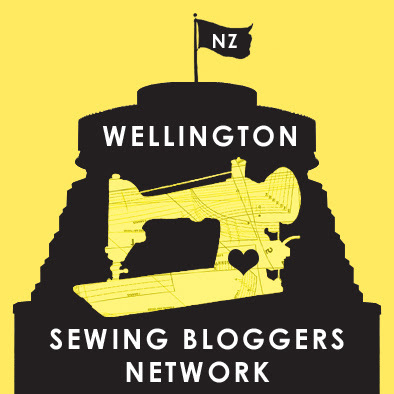 Yep, that’s right – all patterns sold between now and midnight (NZ time) on 19 October will be raising money for this great charity. Now, on to the pattern! I’ve been working on this one for, oh, several months now. 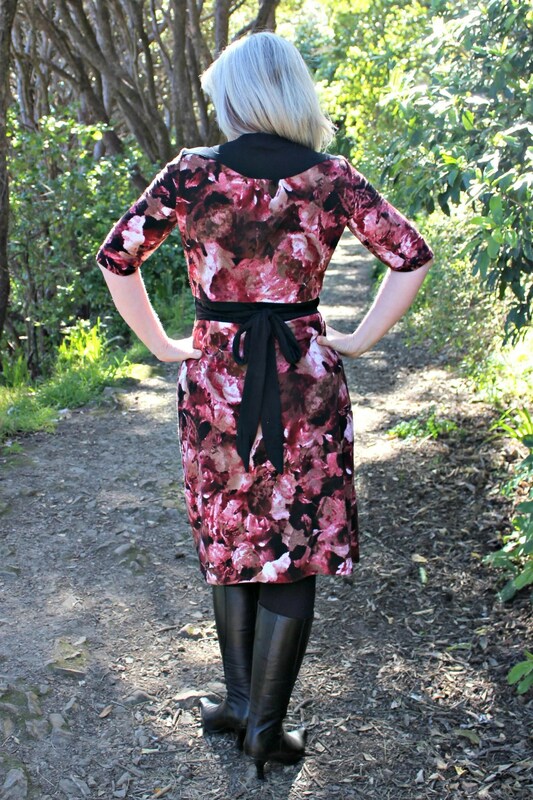 (In fact, one of the first samples appeared on my blog back in July, when I realised too late I’d forgotten to make a dress in time for photos for the Outfit Along challenge. (Whoops!) It got put on hold a while to get the Jenna cardi pattern out the door, but now it’s time has come to see the light of day. 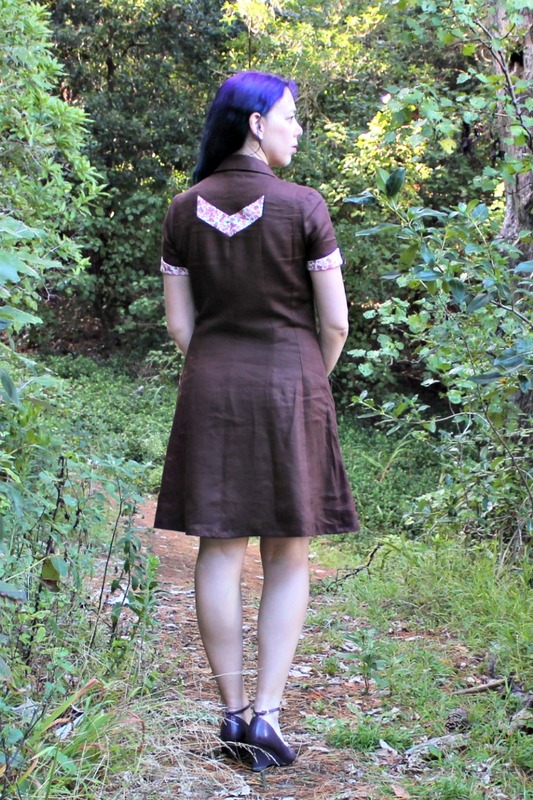 The Gillian wrap dress has shoulder yoke and gather details on both front and back shoulders, for both a bit of a 1940’s look and 1970’s look at the same time. (I find it interesting when style trends pop up in other decades, don’t you?) 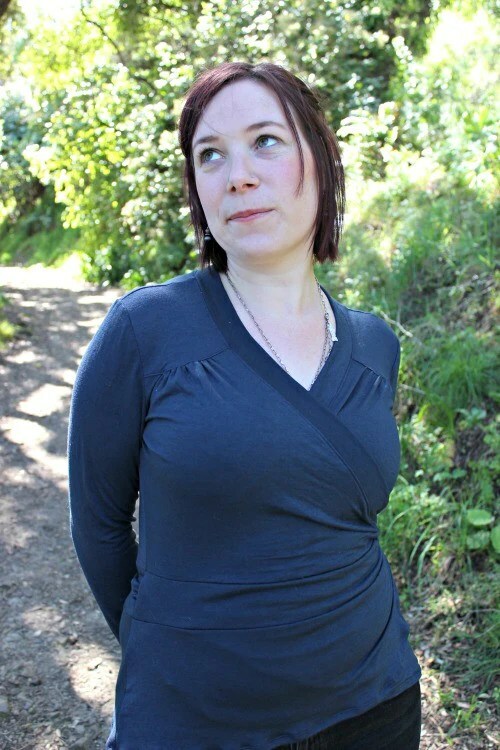 At first glance, the front shoulder yoke details look the same as on the Jenna cardi, but the amount of gathering that goes into them is actually different, since the Gillian is designed to be worn as a top or dress, while the Jenna is designed to be a layer piece (and likely made in thicker fabric, hence it needs more gathering to get the detail showing up). As with the Jenna, there are a few mix-and-match variations you can choose from. You can make it as a dress, a top, or a skirt. You can have short, 3/4 or long sleeves. 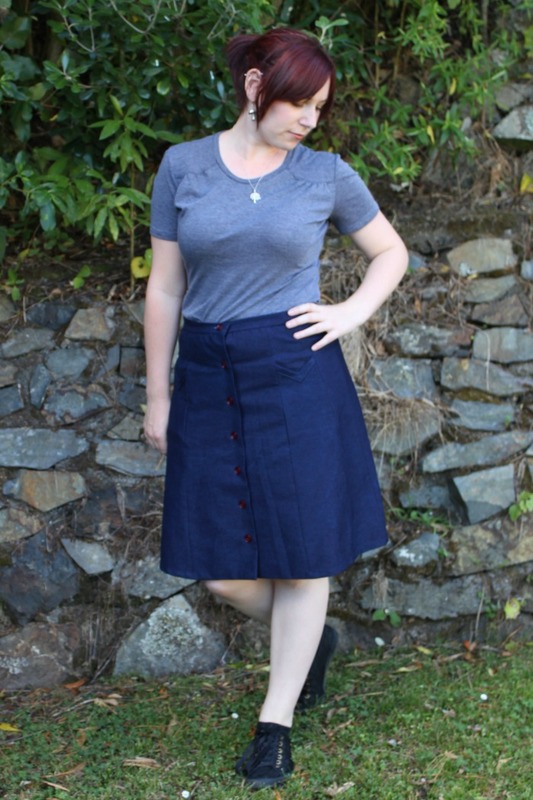 The skirt can sit at knee length or above the knee. Made up in a quirky printed knit, it can be a casual weekend piece. Or in a more sophisticated fabric, a staple for the office. And just because I can, I’m going to hold a giveaway for a copy of the pattern. Want to be in to win? Just comment below and let me know – which variation would you make first? I’ll close off the giveaway on 17 October and announce the winner on 18 October. 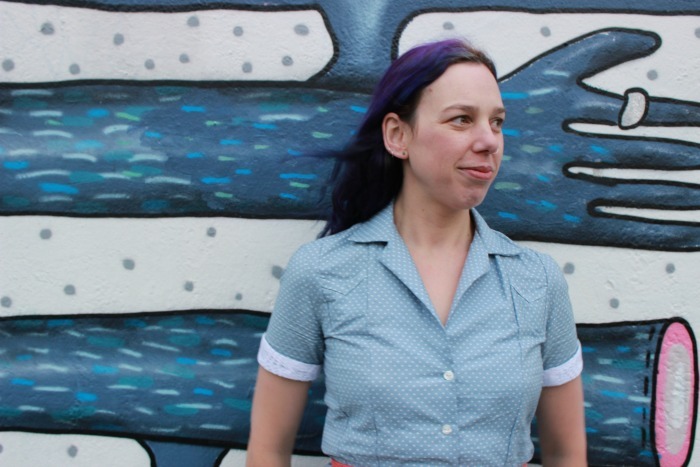 Anyway, a bunch of you went in the draw to win a copy of my new Jenna cardi pattern, and I’ve just drawn the winners, with the help of everyone’s favourite random number generator, random.org. So….. wanna know who won?